I've thoroughly enjoyed reading Pepper Basham's books, so I happily snapped up the chance to read Just the Way You Are and review it. Here's a short blurb, and we'll chat on the other side! Wes Harrison has a past he's ashamed to confess. Suspicious and cynical, he's managed to avoid romantic entanglements since a tragedy upended his career and life, that is until American Eisley Barrett comes along. 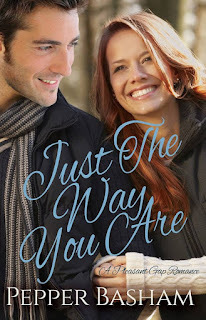 Her authenticity and kindness upend his bitter assumptions and send his heart into unscripted territory. Something I've really grown to love about Basham is her ability to straddle two genres effortlessly. It reminds me that good stories don't have any particular shelf space. Historical or contemporary time periods don't matter. What matters are characters you connect with, timeless romance, and plots that take you on a journey you don't want to end. Just the Way You Are delivers all these things. All together I loved this book and happily recommend it. You can purchase it here. Susan!!! How did I not know you'd reviewed JTWYA??? You gotta share these things with me, girl!